Jacquelyn W. Klein, 86 of Silver Springs passed away on February 6, 2019 at the Wyoming County Skilled Nursing Facility in Warsaw where she had been residing. She was born in Rochester, New York on October 11, 1932 a daughter of the late Kenneth and Helen (Gillette) Willard. Jacquelyn was a graduate of Nunda High School and received her associate degree from Rochester Institute of Technology. She was a breeder of collie, sheltie and Pomeranian dogs. Along with breeding and raising dogs she enjoyed raising and riding horses, gardening, sewing, cooking, playing the piano and spending time with family and friends. She was a member of the American Pomeranian Club and American Kennel Club. 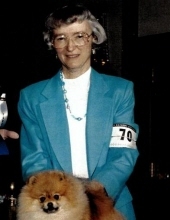 She was a judge for the Pomeranian breed in dog shows across the country. She is survived by her husband: Ronald whom she married on May 2, 1953, 2 children: Virginia (Joseph) Hurley of Victor, Stanley (Michele) Klein of Silver Springs, 6 grandchildren: Colleen (Adam Marquart) Klein, Russell Klein, Heather (Derek) Heiby, Megan Hurley, Bethany (Chris) Bzduch and Christopher (Meghan) Hurley, 6 great grandchildren sister-in-law: Roberta Willard of Monroe, Wa. and a niece and nephew: Teresa and David Willard. Along with her parents she is preceded in death by 2 brothers: Dale and Steven Willard. A Celebration of Jacquelyn's Life will be held on Saturday May 4th at 11:30 am at the Eaton-Watson Funeral Home, LLC. 98 North Main St. in Perry. (In lieu of flowers) Memorial contributions may be made to Alzheimer’s Association 435 E. Henrietta Rd. Rochester, New York 14620 or to the Golisano Children’s Hospital 601 Elmwood Ave. Rochester, New York 14642. To send flowers or a remembrance gift to the family of Jacquelyn W. Klein, please visit our Tribute Store. Guaranteed delivery before Jacquelyn 's celebration of life begins. "Email Address" would like to share the life celebration of Jacquelyn W. Klein. Click on the "link" to go to share a favorite memory or leave a condolence message for the family.